Hi there! 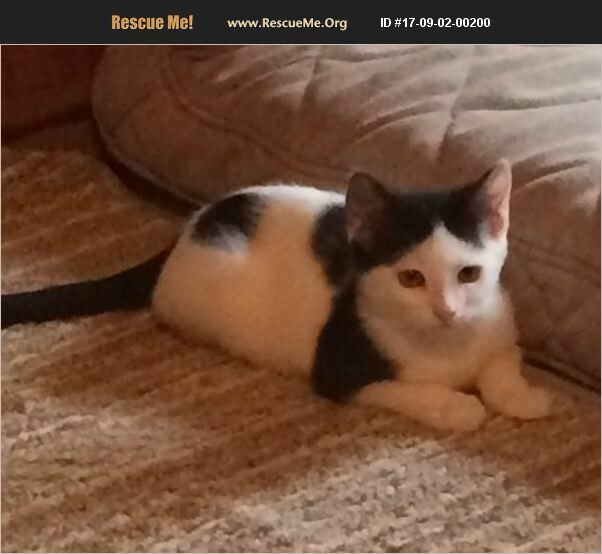 My name is Topper, and I am adorable black and white Turkish Van/ DSH mix fella who was born in late May 2017. I'm considered a Turkish Van mix because I have black ears, tail, and spots on my back. In fact, the Turks would consider these spots to be the blessed thumbprints of God. Don't you just love my little black toupee on the top of my head? And my reverse widow's peak hairline? My brothers Cole, Bandit, and I were born to a feral mama, but our future foster meowmy managed to snap us up when we were 6 weeks old and hand tamed us. Bandit and I are called the terror twins because we get into mischief together. I am a bit timid and get frightened more easily than my brothers; however I am highly food motivated and respond positively to love, attention, and, of course, food! I am available individually or with one of my brothers. (Two is always more fun than one, and we can keep each other company when you are at work or on vacation.) I'm well socialized to the adults, kids, big dogs, and other cats in my foster home, so I would fit into many family situations. Please come meet me today! Maybe God's blessings will spill over on you when you take me to live with you in my new lifetime home! Topper is updated on shots, neutered, dewormed, microchipped, FIV/ FeLV negative, and ready for his indoor-only home. No de-clawing permitted. His adoption fee is $125 for kittens 9 months old and younger, cash or check payable to Buster's Friends. Please click the contact button if you are interested in Topper, and we can let you know exactly where you can meet him. To make the process more efficient, download the adoption application at http://www.bustersfriends.org/catadoptionapplication.shtml. First save and then open it; then you can print it and fill it out.